Steve here. With all of the allegations against Jon “Bones” Jones lately this fight should be interesting. Rampage even called “Bones” a snot nosed kid earlier this week on the Dan LeBatard show in Miami. UFC 135: Jon Jones out to redeem tarnished reputation – ESPN. Check out this great interview with UFC Light Heavyweight Champion Jon ‘Bones’ Jones from Alex Donno of Black Sports Online and 790 the ticket! 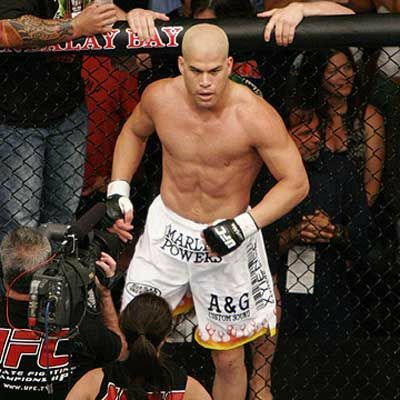 I had a fun interview with Tito Ortiz that I wanted to share with you guys. Tito is promoting a new DVD, “Bad Blood,” that documents his relationship and rivalry with Chuck “The Iceman” Liddell. It’s in stores now on DVD and Blu Ray. I also ask Tito who he wants to fight next and where/when this fight should take place. He is strongly lobbying to fight Rich Franklin on the UFC’s FOX Network debut on November 12th. Dana White says they will announce the FOX main event tomorrow (Friday, September 2nd) so we will soon know if Tito’s wish will be granted. The audio interview is attached to this blog. Look to the right side of the page and click play just under the picture. Enjoy. And for those of you out there who are busy or have a short attention span like I do… the interview is only 7 minutes long. Fedor Emelianenko returns to Showtime this Saturday night, as Strikeforce and M-1 Global present “Fedor vs Henderson” from the Sears Centre in Hoffman Estates, Illinois. “The Last Emperor” Fedor Emelianenko meets fellow ex-Pride FC star Dan Henderson in the main event. To put it in simple terms, this is a fun matchup. Despite the fact that the two fighters are technically separated by a weight class, it’s a fight that Strikeforce needed to make. Fedor and “Hendo” are the two biggest stars in the promotion. To have these two fight one another makes all the sense in the world. For Henderson, it’s a chance to beat a legend, and perhaps steal whatever bit of aura Fedor has left. For Fedor, it’s a chance to prove to fans he’s still relevant, and can still win a big fight. Not too long ago, Fedor was riding a 27 fight winning streak, but now he comes off two straight losses, the first of which was a somewhat fluky first round submission against Fabricio Werdum. He followed that up with a severe beating at the hands of the massive Antonio “Bigfoot” Silva. “Bigfoot” represents the new breed of MMA heavyweight, standing six-foot four inches tall and cutting weight to reach the 265 lb heavyweight limit. Fedor, on the other hand, is a throwback heavyweight, generously listed at 6-feet tall with a pudgy 230 lb physique. In reality, a loss to a physical specimen like Silva should not raise too many eyebrows, but many fans viewed it as a sign that Fedor was overrated all along. A win over Dan Henderson would go a long way to help salvage Fedor’s legacy. At age 40 (6 years older than Fedor), Dan Henderson appears dangerous as ever. “Hendo” has won two straight fights, both by knockout, and holds the Strikeforce Light Heavyweight Title. This fight will be contested at heavyweight, and Hendo expects to weigh about 206 lbs on fight day, making him considerably lighter than his opponent. To me, Henderson has very little to lose in this fight, if anything at all. If Fedor comes out victorious, fans will note the fact that Henderson was at a significant weight disadvantage. He will still have his light heavyweight title, and can move back down in weight to defend it. For Fedor, this fight may be his last chance to prove to fans that his nearly 10 year unbeaten streak wasn’t merely a side-effect of questionable matchmaking. Both men possess knockout power in their respective right hands. Both have an exellent chin, at least on paper. Henderson has never been knocked out, ever. Fedor has suffered a pair of TKO losses, but has never been knocked out clean. Unless Fedor pulls out a submission, which is certainly a possibility, I expect this one to reach the judges’ scorecards. In this fight I lean slightly to Dan Henderson for 2 reasons. 1) Speed. And 2) wrestling. As a 2-time Greco Roman Olympian, Henderson should be able to dictate where the fight takes place. If Fedor starts controlling him in the standup, Hendo will have the ability to take him to the ground. My Pick: Dan Henderson by Decision. Co-Main Event: Marloes Coenen (champion) vs Miesha Tate- Women’s welterweight championship. At the risk of sounding like a broken record, I think wrestling will be the difference in this fight. Tate is an accomplished wrestler, coming from a wrestling heavy camp in Team Alpha Male. We’ve seen Coenen struggle to stay vertical against wrestlers in the past, but she does offer a serious submission threat off her back. There’s no question in my mind that Tate will take her down repeatedly, but the difference in the fight will be whether or not Coenen can catch her in a submission. In a 5 round fight, Coenen will have plenty of chances, but I have faith that Miesha will stay out of trouble and grind out a decision. My Pick: Miesha Tate by Decision. This fight should be fun. Lawler will hold the advantage in the standup, with his undeniable knockout power. Kennedy will have the edge if and when it goes to the ground. I’d also give Kennedy the advantage in the clinch. Expect some fireworks in the first round, but eventually, Kennedy will wear him out and take him down. When I look into my crystal ball, I see Kennedy winning this one with ground and pound in the second round. My Pick: Tim Kennedy by TKO, Round 2. Up and comer Tyron Woodley (8-0) faces the biggest challenge of his young career. Knockout artist Paul Daley (27-10-2) thinks Strikeforce put him in this fight against an accomplished wrestler expecting him to lose, given the fact that wrestling has always been his Achilles heel. Daley says he will prove his doubters wrong, though, citing his experience, and self proclaimed improving wrestling defense. Maybe he has a point, but logic tells me Woodley will win this fight with takedowns and top control. Finishing Daley won’t be easy, so I’m expecting a decision. If you need evidence of Daley struggling against wrestlers, check out his fights against Josh Koscheck and Jake Shields. My Pick: Tyron Woodley by Decision. I expect Saffiedine to be better than Smith in every aspect of the fight, with the only x-factor being Smith’s tendency to pull off amazing and somewhat lucky comebacks every now and then. Consider his miraculous comeback wins over Pete Sell, Cung Le, and Benji Radach for reference. At this point, I question Smith’s chin, and I look to the well rounded and technically superior Saffiedine to win by TKO. My Pick: Tarec Saffiedine by TKO, round 3. Strikeforce and M-1 Global Present: Fedor vs Henderson takes place this Saturday Night, July 30th, Live at 10pm EST on Showtime. At UFC 130, Quinton “Rampage” Jackson finds himself in a familiar place: the main event. Originally touted as “Edgar vs Maynard III,” UFC 130 lost its original main event mere weeks ago, when both lightweight champion Frankie Edgar and top contender Gray Maynard pulled out of the fight with injury. Now, Rampage vs Matt “The Hammer” Hamill sits at the top of the fight card. Though not guaranteed, it’s possible the winner will be next in line for a title shot against light heavyweight champion Jon “Bones” Jones. Saturday will mark the seventh time that Rampage has fought in a UFC main event. He’s 4-2 in his previous 6, with notable wins over Chuck Liddell (to win the title), Dan Henderson (to unify the Pride FC and UFC titles), and most recently over Lyoto Machida at UFC 123. Despite fighting so many times on MMA’s biggest stage, the amazing thing about Rampage is, he doesn’t seem to be trying particularly hard. He’s notorious for abhorring hard training, and admits that it’s no longer easy to find the motivation to go 100% in the gym. Lately, he’s been getting noticeably out of shape between fights, and nearly retired from the UFC after starring in “The A-Team” in 2010. He’s 1-1 in the Octagon since returning from that hiatus. On the surface, he seems to lack the motivation that most fighters require to stay at the highest level of the sport. He even turned down a March title shot against Mauricio “Shogun” Rua, citing that five weeks would not be sufficient time to prepare (Jon Jones accepted the fight after Rampage refused it.) It’s rare for a UFC fighter to turn down a title shot, even under such non ideal circumstances. So how does Rampage manage to keep fighting at such a high level despite his borderline apathy? In my opinion, his sustained success in the Octagon comes from killer instinct coupled with God-given athletic abilities. He’s talented enough to cut a few corners in the gym, and prideful enough to find just enough motivation needed to keep competing at an elite level. To put it in simple terms: to some, fighting is life. A part of Rampage wanted to walk away from fighting to pursue a budding acting career. A bigger part of him could not sit idly by while Rashad Evans accused him of being a coward. And of course, earning 6-figure paydays per fight must also be a nice perk. Surely there was a time, probably during his Pride FC days and early in his UFC tenure, when Rampage had that raw determination and pure desire that creates champions in a sport where hard work is not only rewarded, but absolutely necessary. But some time along the way, he lost a spark or two. Originally, Rampage made headlines by saying he wasn’t particularly excited to face Matt Hamill. On a recent conference call, he went even farther than that, saying he “no longer gets excited about facing anyone.” Comments like that sound uncharacteristically apathetic for a UFC fighter. But to Rampage’s credit, he says his motivation is “to win,” and that’s probably motivation enough for a man with brute strength, lethal knockout power, and a well rounded skill set. Now though, Matt Hamill is trying his best to motivate Rampage, whether deliberately or not. The former elite college wrestler was quoted saying he would “break [Rampage’s] will.” That comment made Rampage raise an eyebrow. “When he said that, that motivated me as much as I’ve been motivated in a fight.” It may be the spark he needed. Suddenly, Hamill is more than just another nameless opponent. To Rampage, a fight with Hamill is now personal. Hamill may have woken up a sleeping giant. Does Rampage have another run at the title in his future? Rashad Evans is risking a title shot by fighting prospect Phil Davis at UFC 133 in August. Even with a victory over Davis, the timing of that fight may not coincide with champion Jon Jones’ return from a hand injury. As a result, the Rampage/Hamill winner may very well be next in line for a crack at the belt, likely in October or November. Rampage insists that he will retire at age 35. He turns 33 next month. The final two years of the Rampage era begin this Saturday, May 28th, at UFC 130. Hopefully, we continue to see an intense, focused Rampage in the cage, not an apathetic former champion merely doing the bare minimum to keep collecting a paycheck. I’m expecting and hoping for the former, not the latter. At first glance, KJ Noons looks more like a movie star than a mixed martial artist. Think Keanu Reeves meets Johnny Cage of Mortal Kombat fame; add Cage’s penchant for decapitating his opponents via brutal uppercut and you get an idea of the power that Karl James Noons wields in his fists. Perhaps the best pure striker in all of mixed martial arts, the former EliteXC lightweight champion is a systematic assassin in the cage. KJ Noons has bobbed, weaved, and jabbed his way to a record of 9-2 -the majority of his wins coming by way of spectacular knockout. Enter the cage with King Karl and you might leave sticking out like the victim of a chimpanzee attack walking the runway during Milan fashion week. If Noons were a doctor, his opponents would be chronic insomnia patients lining up to fill their prescriptions of knockout power to help put them to sleep. The Winner in six of his last seven fights, Noons holds prominent wins over Yves Edwards and StrikeForce’s welterweight champion Nick Diaz. On the horizon of a number one contender fight with Jorge Masvidal, Strikeforce’s very own, KJ Noon’s took time out from his grueling training regiment to chat with Brian Peterson. Now that StrikeForce is under the Zuffa banner, will we see KJ in any crossover fights? Who does KJ think would play him in a movie? All that and more with the heavy handed KJ Noons after the jump. BP: First things first, how’s the hand healing? KJ Noons: Hand feels great. I’ve been working out, sparring, and was getting ready to be on this past April card, but StrikeForce couldn’t get me on. Had surgery on the hand and everything is working. BP: In your last fight against Nick Diaz, you were an absolute nightmare for Concubox. You landed a total of 310 total strikes and out struck the reigning welterweight champ by 116 strikes. Given the outcome of the fight, what was going through the mind of KJ Noons after seeing such a one sided strike total? KJ Noons: I thought after the fight my hand would be raised as the winner, but the judges saw it a different way and that’s why they say, don’t leave the decision to the judges. BP: You’re known as a fighter who trains in multiple areas throughout California and Tijuana. Have you ever given thought to being exclusive to one camp or do multiple training grounds give you an extra edge as a fighter? KJ Noons: I think whatever works for a fighter they should do. I feel like traveling and getting different sparring partners is good. Its fun, keeps it interesting and you meet a lot of different people. BP: Lately, there have been a handful of fighters calling you out to the point where Gilbert Melendez interjected and said, “They are all calling out KJ Noons. What about me? I’m the champ.” Why do you think so many fighters are singling you out? KJ Noons: Don’t know why, I’ll take it as a compliment meaning they want to fight an exciting fighter. BP: With Zuffa’s acquisition of StrikeForce, are there any crossover fights that you would like to be a part of? KJ Noons: I don’t know if they are going to be doing any crossover fights soon, but if they did I would fight anyone the fans would like to see or an exciting match up. BP: You are widely considered to be the purest striker in MMA and your takedown defense is only getting better. With that being said, you present a bad matchup for Gilbert Melendez. Now that you’re back in the lightweight division, is there any chance of that fight coming to fruition? KJ Noons: StrikeForce is going to give me a #1 contender fight against Masvidal in the future and the winner gets a title shot. BP: You’ve stated in the past that you’d be open to fight Floyd Mayweather and Manny Pacquaio. What are the odds of KJ Noons in any type of boxing match now that StrikeForce is under the Zuffa banner? KJ Noons: Slim to none. I think it would be fun; both of those boxers are some of the best boxers ever. I think I will be able to get some good boxing matches in the future if I am not under the Zuffa Banner, but I’m going to concentrate on one belt in MMA for now and see how boxing goes out over the future. I love boxing, but I got to pay the bills, and MMA does that right now. BP: You’re trained in the disciplines of boxing, Muay Thai, Sanshou, and Kenpo karate, how has the transition into Jiu-Jitsu been going? KJ Noons: Great, I like jiu-jitsu, and you have to train in it to compete at this level, but I would rather finish someone with strikes than a submission. BP: If you weren’t an MMA fighter/boxer you’d be? BP: Who would play you in a movie? BP: Last but not least, are there any fights on the horizon for you? Jorge Masvidal recently stated that he can and will beat you. What are your thoughts on a potential matchup? KJ Noons: That’s the future fight. Good match up for me. Just show up to the fight Jorge, that’s all I ask. Once again, special thanks to you KJ and best of luck from Brian Peterson and the staff @ Cinesportstalk.com. We look forward to seeing you back in the cage soon.